Publishing with email or through content management systems is like sending documents out into a black hole. Who knows what people are doing with the information once it reaches them? SavvyDox tells you exactly who has downloaded, opened, read a document, what activities are pending, by when and what has been completed. You can even see which pages readers, reviewers & approvers have read. All available through the dashboard or from within Word. SavvyDox gathers lots of granular data that supports customized reports. In an environment where compliance is crucial, you have the data to ensure that people are following through to get vital information. In regulated industries, all versions of a document must be tracked with time and date stamps so that the integrity of evidence and other information is maintained. 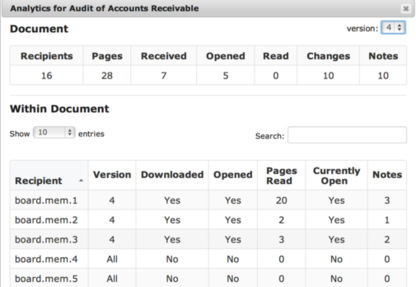 SavvyDox maintains a single record of a document, with all revisions over its history contained inside. Auditing a single document instead of multiple copies saves you time and money, and there’s less chance of loss or error that could jeopardize evidence. All of these benefits combined reduce your business risk. In today’s litigious world, risk reduction has become a key business priority.